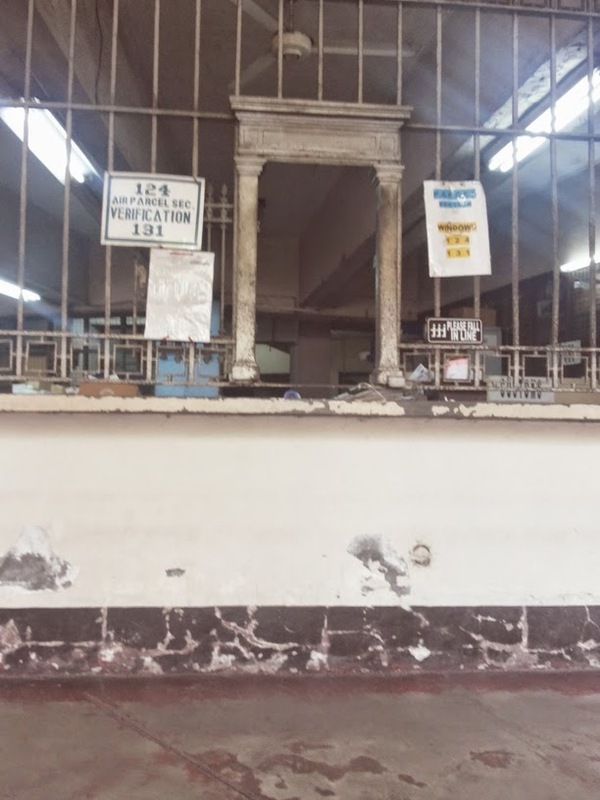 Some months ago, I wrote about my admiration to the neoclassical architecture of the Philippine Postal Corporation. If you have noticed, the pictures were limited from the façade and the external structures of the building. I haven’t shown anything within the premises. On the few times I visited the Philippine Postal Corporation, I always catch an ongoing event. The main service area that accepts all letters and packages has an equally magnificent architectural finish. The high ceilings with intricate detailing, sturdy and elegant marble tiles, wooden tables reflective of the old and local wooden carvings and the distinct patterns of the metal railings of each transaction counter. 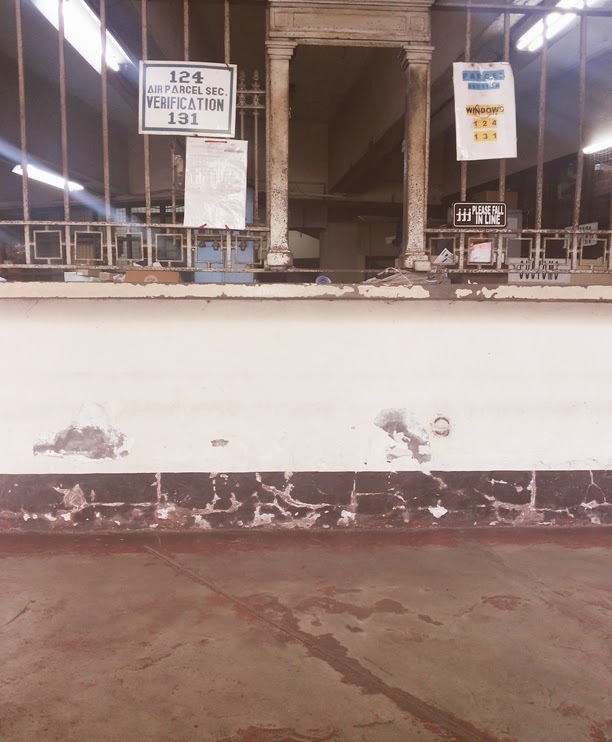 While some of you might think that the Philippine Postal Corporation is perfect, there are far more hidden areas of improvement that demand attention. More than the decline of the usage of traditional mail, some facilities inside the building are pleading for restoration or at the very least, minor renovations. Whenever I have to claim a parcel abroad, I always receive this notification to visit W-124. The section is situated in the underground level and often unknown to everyone. In my case, I discovered the area when I decided to redirect all my packages at the workplace’s address. Since I work in Manila, I figured out that my packages would arrive earlier. On my first time to visit W-124, I have to inquire for specific directions. The security personnel were kind enough. As I was navigating my way to the underground floor, a few employees willingly pointed me the direction even without asking. When I found the W-124, this is what fronted me. Cracked and bare cement floors that still exhibit cleanliness though, heavily stained walls, rusty metal gates that separate the clients from the attending employees and counters that would at least look half decent with minor repaint. The customer reception area looks so pathetic. One can’t imagine this condition to exist, amidst the magnificent neoclassical architecture. However, there are far more depressing scenes. The place where the attending employee stays is more tragic. I didn’t take photos out of respect and courtesy. But dear God, the area where packages are sorted will never look conducive for working. It is not airconditioned although there are electric fans provided. How could they bear the heat in the always summer temperature in Manila? The bare cement floors, dark and unpainted walls, poor lighting and the ceilings that are meant only for storage of old and unused things. The area looks like the classic warehouse used as hideout for gangsters and kidnap victims in those local action films. In short, the area will never be conducive for working. While I don’t have the right to complain for the employees, I feel a degree of sympathy for them. The kind of services they are rendering does not reflect any sign of dissatisfaction from their pitiful workplace. The employees are courteous, smiling and don’t look exhausted at all. In fact, I’m the one who looks more haggard. lol Sometimes I even caught them joking and laughing over silly stories. I often subscribe to the idea that happy employees are bred by a favorable working environment and good pay. But the employees designated at W-124 serve as real life contradictions of this traditional belief. I also have to mention the transparency and strict compliance of the designated Customs Officer. Despite his huge and intimidating beer belly (heeehee Sorry, Sir), he was consistent in implementing the custom fees. I’ve heard a lot of horror stories about unexplained and anomalous fees. In my case, I never experienced any form of extortion or corruption. I only paid the mandatory Php 50 inspection fee for my packages worth less than Php 3,000. While my post can't do anything to improve their welfare, I just want to commend the hardworking and forever customer oriented employees of the Philippine Postal Corporation. My recognition specifically goes to the customs officer and the two lady personnel assigned in W-124. Despite the negative impressions that taint government employees, they provided great service doesn’t come with an expensive pay and price tag.